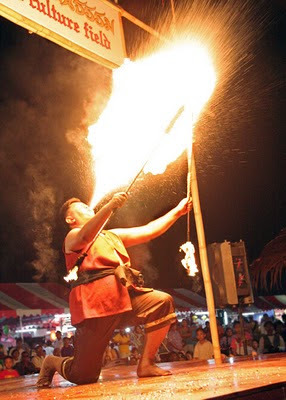 I have seen mention of this festival for several years on various Phuket news websites, but never really thought about checking it out.. I figured it would be just another local fair, maybe not worth the 30 minute drive to Thalang. Wrong. The Heroines Festival is something much more than just a bunch of food and handicraft stalls, very much worth going (even if it was hard to find!) and the whole family enjoyed it. 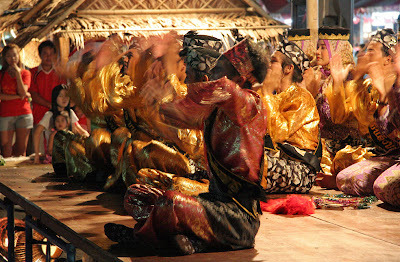 The festival was on from 5th - 20th March, with the big performance featuring hundreds of performers on the 13th, 14th and 15th. I think the dates are the same every year because March 13th marks an important date in the history of Phuket... In 1786, the Burmese invaded, but were beaten in the battle of Thalang. The Phuket defenders were led by 2 sisters called Chan and Mook, the former being the widow of the governor who had died not long before. At that time, Thalang, the town in the middle of Phuket island, was the main town, and here the battle was fought, ending with the Burmese retreating on March 13th 1786. 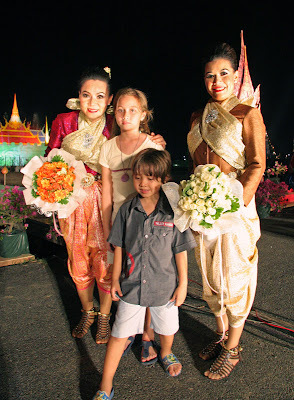 The 2 sisters were later honored by King Rama I, being given the names Thao Thep Krasatri and Thao Sri Sunthorn. We decided to have a look at the festival on March 13th. 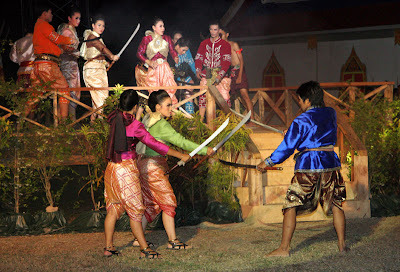 I had seen in the Phuket Gazette that the festival takes place "near the Heroines Monument" - this monument is in the center of a traffic circle, showing the 2 sisters with swords drawn - pretty much every tourist visiting Phuket will pass this monument on the way from the airport to the south of Phuket. So, we drove to the monument. No sign of a festival. We asked a policeman. "Ah, no.. you have to drive up to Thalang Town", he said (another 6km north). At the traffic lights in Thalang we turned left. Again, no signs or directions to the festival. Little surprise that we saw just a few foreign faces that night! 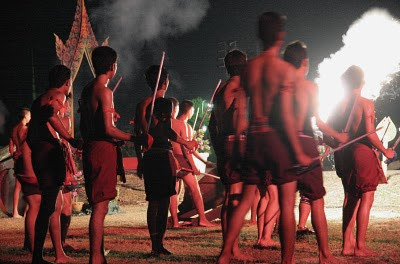 These local festivals are often hard to find - I went to one last year in my local village and didn't see any other non-Thai people! It was only at the entrance to the park where the Heroines Festival was taking place that it was obvious where to go - we entered, parked and headed towards the lights and crowds. 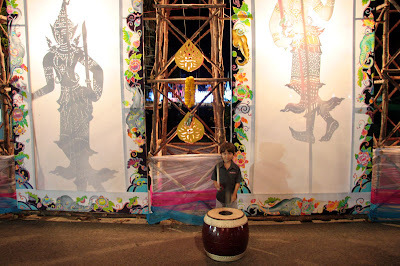 At the entrance to the fields where the festival was taking place, my son stopped to play drums. The road was lined with food and drink stalls of all kinds - we didn't stop, as we were a little late and I could hear that the main performance had started. We then found a place to sit and watch the performance - there were seats set up, but all were taken already so we were kind of on the edge and the stage was a large area - parts of the show were just 10 meters from us, other parts out of sight! 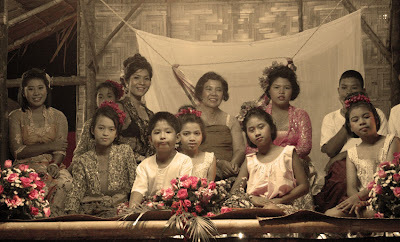 As the story was told by a narrator (in Thai.. no subtitles), actors played the roles of the locals and the Burmese. 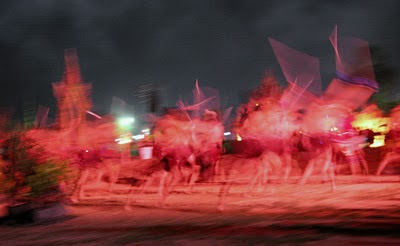 Dramatic music accompanied the performance. The music was familiar. Think Darth Vader. Think Superman. Yes, seems John Williams had written the score.. wonder if he knows about it? The 2 photos below represent part of the heroine's history before the battle. I am not sure of their whole life stories, I have read that Chan was jailed at one point because her husband had been in debt. Any local historians reading this? Please do correct me! She then escaped and headed back to Thalang just as the Burmese were starting their invasion plans. And the battle was won.. March 13th 1786... roll forward 225 years. Did someone say "Phuket is just bars and tourists"? There is a rich history here which is well worth celebrating. 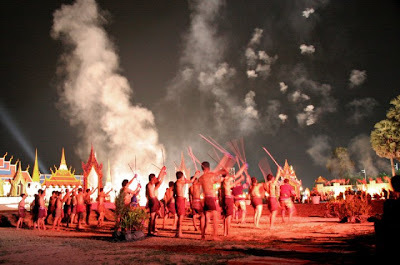 This festival, as I say, is largely unknown to tourists. I mean, even we had trouble finding it! I won't even mention the wrong turn we took after the festival.. we ended up driving off through the rubber plantations of Thalang rather than finding the main road again - it's quite rural in this part of Phuket..this is the real Phuket, the old Phuket. 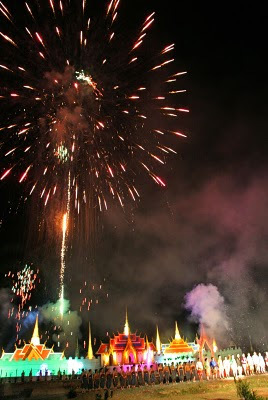 Fireworks marked the end of the show, with the heroines being honored by the King and Phuket safe from harm. The huge set for the show included a mock-up of the Grand Palace in Bangkok. The performance over, we had the chance to mingle with the stars of the show and take some photos. 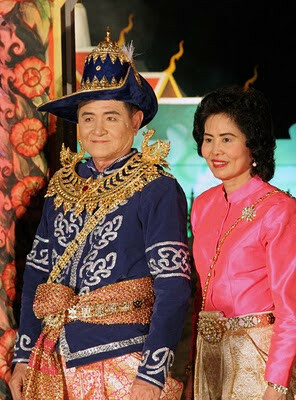 I caught sight of the Governor of Phuket, Mr Wichai Phraisa-ngop and his wife - ah yes, this festival is a big one. We shook hands and said "Pleased to meet you".. I should have slipped him a business card. He seems a good guy. Our governator is not afraid to take on the hard issues like jet ski rip offs and now he's having a go at sorting out the issue of public transport in Phuket. Well done, sir! The stars of the show, Chan and Mook were happy to pose for photos. Our daughter has already learned something of their history at school. I think our son just thought their swords were cool. Wow. I was very happy that we had made the effort. Kids enjoyed seeing something different - it did go on quite late, kids were sleeping in the car by the time we got home. For the purposes of this blog, a festival like this is gold! 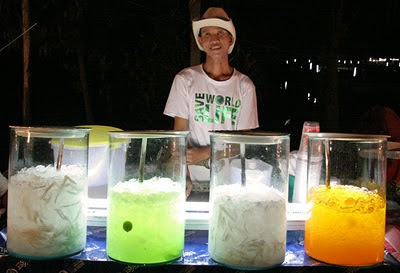 I started the blog in 2006, trying to show the "other" Phuket, off the beach, away from the tourist crowds. 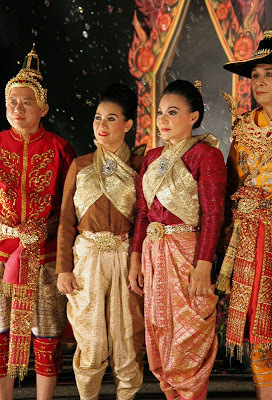 March is a great month to be in Phuket - weather is hot and sunny, it's out of peak season - and now, if planning for next year, remember the dates 13th to 15th March - the Phuket Heroines Festival.